Few things will grab a middle-aged man’s attention like an iPad full of old Atari games and a ball-end joystick. There is something about that specific mix of electronic nostalgia, the promise of adventure, and the experience of sweet limbic release that allows him to relax into the experience at hand, his face slack, his hand jazzing the stick like a rat trained to respond to reward behavior. That’s why the iCADE from ThinkPad is so great: it makes you think you’re a kid again, slamming quarters into Crystal Castles while waiting for you dad to pick you up from the roller rink. It’s a visceral feeling to see old games finely reproduced inside a little arcade cabinet whose brightly colored decoration reminds you of a simpler, happier time. 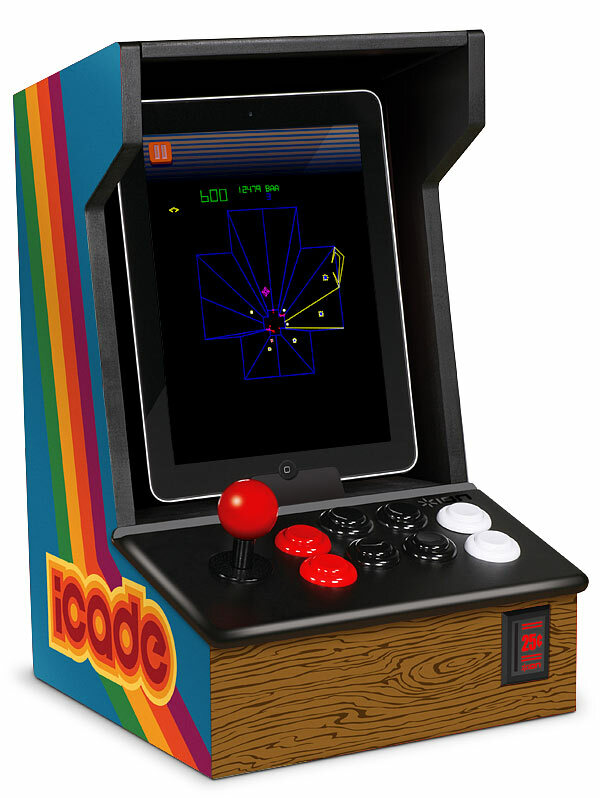 The iCADE is basically a little cabinet that holds your iPad. It has a little clip that holds the iPad snug in portrait mode although you can turn it around into landscape (although that’s not recommended). It has a joystick and eight buttons and is currently only compatible with Atari’s Greatest Hits, allowing you to play a number of arcade classics as well as a plethora of arguably terrible Atari 2600 titles (I’m sorry, but that stuff is pretty rough). It connects to the iPad via Bluetooth and, in essence, acts as a Bluetooth keyboard. Presumably game manufacturers could easily retrofit their games for the iCADE and what I wouldn’t give to play Super Mega Worm on this thing. The iCADE costs $99 and you have to put it together yourself using a few screws. It would make for great cubicle decoration but because it doesn’t charge the iPad it doesn’t make a very good dock. Generally it’s nice for bringing out at a party, playing for a while, and then putting away. I slapped this thing on the dining room table this weekend and saw a number of my house guests stop, stare, and then play for a good half hour until the majesty of Missile Command wore off. To be clear, this is a novelty akin to the junk you used to buy at Spencer’s Gifts. Until it supports more games you’re basically dealing with a one trick pony. The joystick/buttonpad is also a little cramped because of the iCADE’s small size and and $99 for a denuded keyboard and some particleboard is a little steep. In all you get a little bit of buyers remorse once you realize this thing will be sitting on your dark from now until the end of time. However, if you’re the kind of guy who buys old pinball machines for the basement and has a bust of Darth Vader on a shelf above the bar, this might be a good addition to your man cave. Otherwise, why not just go to an actual arcade and play a few boards of Pac-Man? It’s cheaper and it will relieve that video game craving far more quickly. Regardless, it was fun while it lasted and it was amazing seeing grown men become kids again, if only for a fleeting, pixelated second.